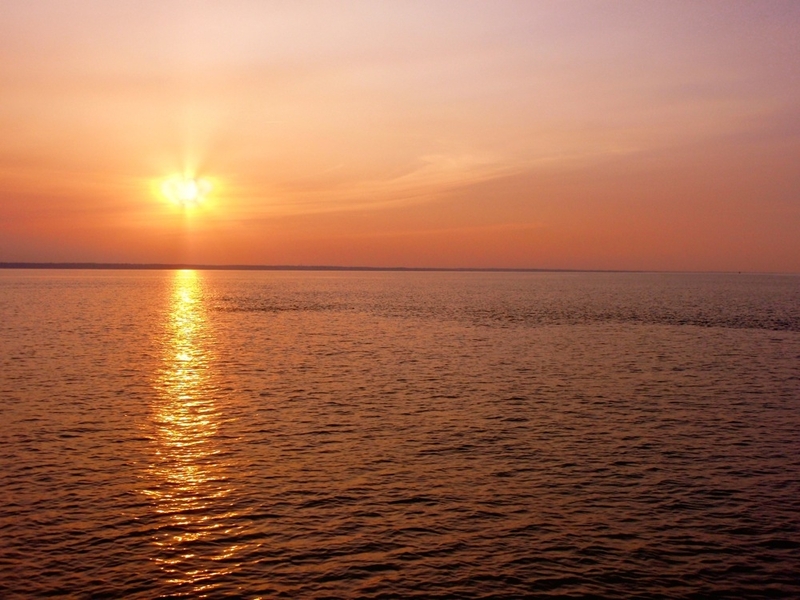 Channel catfish at Hackett’s Bar, carp at the Bay Bridge, snakeheads in St. Jerome’s Creek, and very few stripers in their usual haunts around Kent Island – what’s up with all this late-spring craziness in the Chesapeake Bay? Most fishermen are blaming salt, or more specifically, a lack thereof. Very wet weather in the Susquehanna River watershed has meant lots of fresh water entering the Bay. It’s highly unusual for the Bay to be this fresh in June. Some stations are reporting the lowest readings in recorded history. Salinity is expressed in parts per thousand (ppt), in other words, the number of grams of dissolved salts present in 1,000 grams of water. The water in the Atlantic Ocean is about 35 ppt. Surface salinity today at the Gooses Reef Buoy in the Mid-Chesapeake Bay is 2.0 ppt. That’s low! 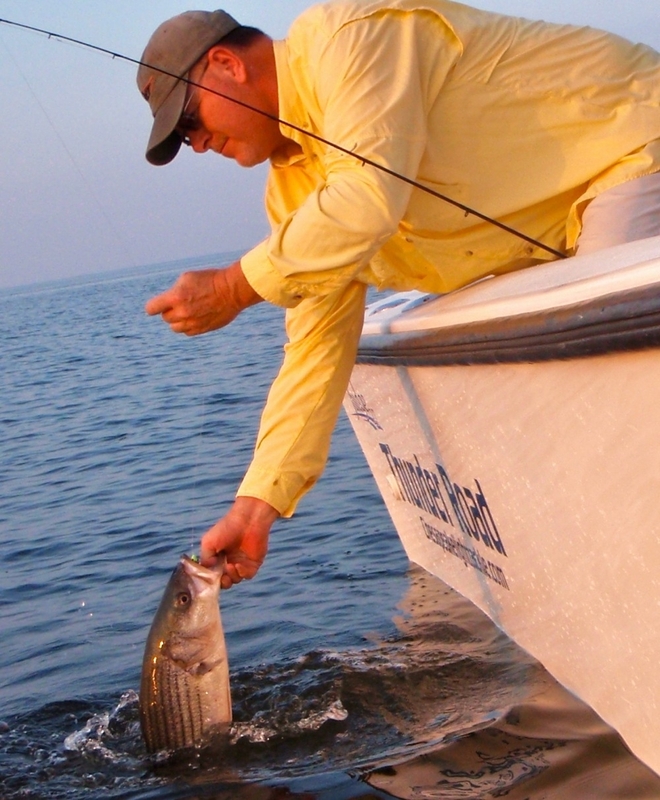 For better striped bass fishing, we need more salt. Fishermen have long recognized the importance of locating comfort zones where fish prefer to stay, but sometimes that isn’t so easy. Fishing in late May and early June is usually a challenge, but low salinity levels have made it especially difficult this year. Complicating the matter is that he water can be a lot saltier on the bottom of the Bay than it is on top this time of year. Since, in addition to surface observations, The Gooses Reef Buoy also provides salinity readings from the bottom of the Bay, we can see that it’s currently 7.1 ppt. That’s over three times saltier than it is on the surface. Striped bass are classified as anadromous, meaning they live primarily in salt water but migrate to fresh water to spawn. While they can live and thrive in fresh water, they prefer water with some salinity. Scientific opinions are mixed as to the optimum salt content, but there’s no denying that salinity influences the behavior of rockfish in the Bay. In my opinion stripers will sacrifice food requirements in favor of more temperate feeding zones. In other words, they would rather eat a little in comfortable water than a lot in water they don’t like. 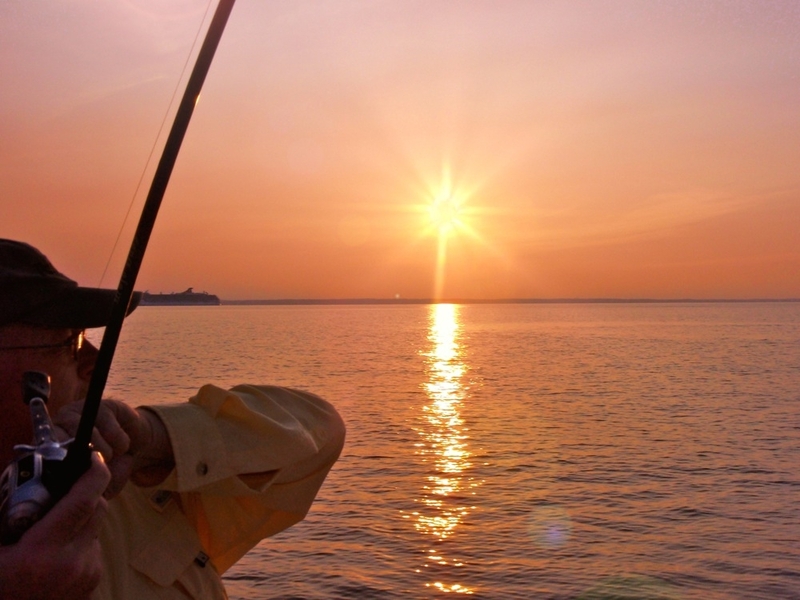 Finding comfortable temperature layers where the water contains the optimum amount of salt is key to successful light tackle fishing in the Bay. That’s easy to say, but somewhat difficult to do. My solution has been to run south in search of saltier water. 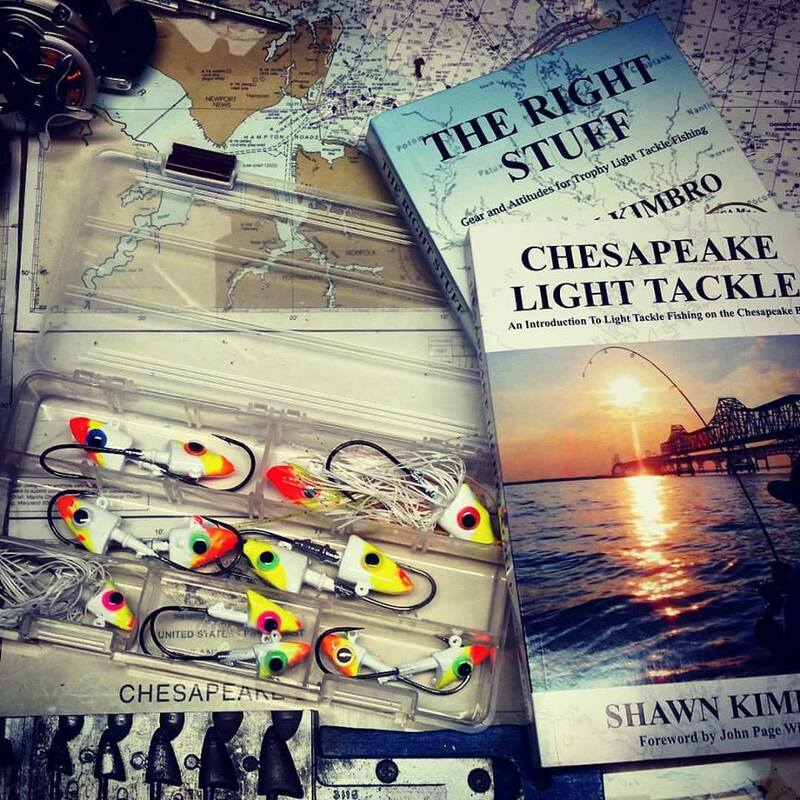 Normally I’m fishing the Bay Bridge, Eastern Bay, or the mouth of the Chester River this time of year, but lately, those areas aren’t producing too many quality fish. On the other hand, things pick up once you get south of Poplar Island because there is more stratification and saltier water down deep. This past weekend there was a very well defined halocline at 30 feet on the west side of the Bay from Chesapeake Beach down to the mouth of the Potomac. On that side of the Bay the fish have been holding very near that layer of salty water. There have been some very nice fish caught there. On the east side the water is mixed up a little more, and fish can be found at almost any depth depending on the conditions of the day. Suspended fish can be challenging to catch on light tackle because of the difficulty of keeping the lure in the strike zone. Light jigs are better because they sink more slowly, and some fishermen are finding success by casting and steadily retrieving swim baits. My normal inclination is to bounce jigs off the bottom, but during this unusual time it’s best to turn loose and just snap the lure back to the boat, then cast out and do it again. Vertical jigging will also catch fish because it’s easier to judge how deep the lure is, but big fish won’t usually hang out right beneath the boat. You’re likely to catch bigger fish by casting back against the direction of the drift. I fished twice this weekend. Saturday I fished with one of my regular fishing partners Rich, in the CCA Kent Narrows Catch-&-Release Light Tackle tournament. We did a lot of running and looking around hoping to find bigger fish on the west side of the Bay, but ended up on the east side jigging suspended schoolies. We caught dozens of fish, but our biggest was only 24 inches long. Even though we were disappointed that we couldn’t find anything bigger, it was still a fun day and I’m glad I got to fish the tournament this year. Sunday evening I picked up my buddy Jamie at the Claiborne Ramp and we ran south over flat calm seas back toward a place where he’d found fish earlier in the week. Unfortunately, they weren’t where we wanted them to be. We caught a few sma ll suspended fish before deciding to check some ledges that dropped from 15 to 35 feet near the main channel. After hitting a few non-productive spots, I happened across a ledge I don’t usually fish and, wouldn’t you know it, the fish finder lit up. We often talk about how fish will hold on ledges waiting to ambush bait, but it’s rare that we get to see it happen. The fish were not actively feeding, but just suspending in what must have been a comfort zone near the bottom. Jamie looked out toward the channel where a cruise ship was making it’s way down the bay and pointed to something he thought might be an approaching school of menhaden. I thought he was just seeing a boat wake but it wasn’t long before it became obvious that he was right. 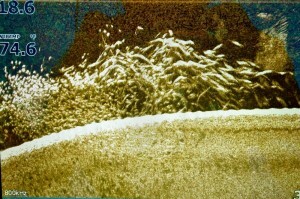 A school of peanut bunker at least a quarter mile wide was moving directly toward the ledge where the stripers were holding. 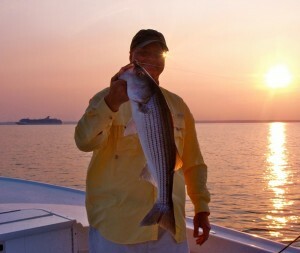 Did the stripers know the bait was coming? Who knows, but I can tell you this for sure, those fish were at the right place at the right time, and so were we. 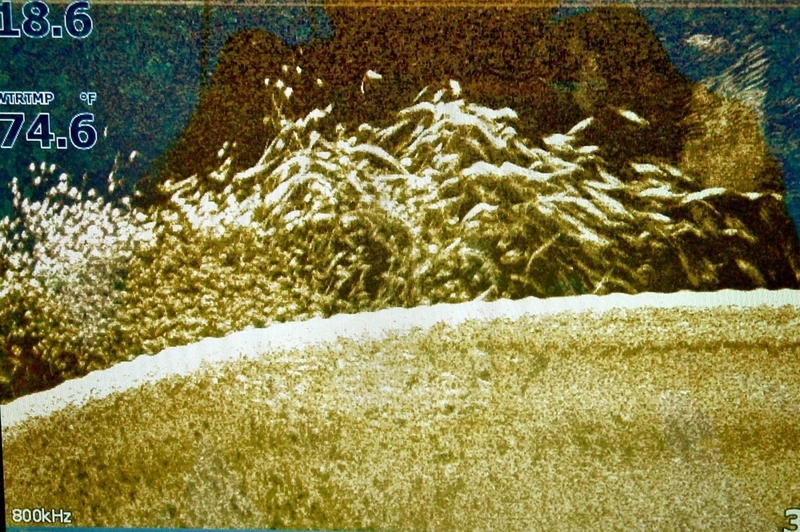 There was never any fish breaking, nor screaming birds overhead to give away the melee below the surface, but I imagine the engagement beneath our boat was intense. We both hooked up right away with nice fish, released them, and threw back after more. 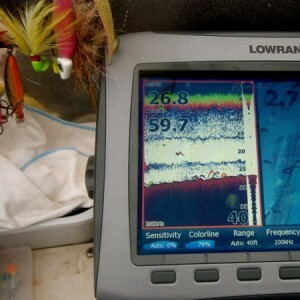 Somehow I managed to get a few shots of the carnage on my fish finder and downscan. We stayed on the bite until after sunset as more and more hapless baitfish moved steadily into the ambush zone. Half-ounce jig heads and hotrodded 6-inch BKDs were the best lures, although I also caught a few fish on a 10-inch lure. After some of my fishing trips lately, it’s very encouraging to see this kind of activity. Shawn, great time last nite…that was as many fish on the screen as I have seen in a while..I think you’re right, those fish were waiting to ambush the bait..nothing like catching nice fish suspended with light jigheads..the pic of the menhaden school came out great…be seeing you soon..really nice write-up as usual..
Good thing you take so many good pictures of my son – Jamie – Usually doesn’t pose much for any other kind of picture. Bet he will now though with these new grandbabies. Article was great, as usual. I can’t buy a fish in the upper bay this year. Well, actually I can buy them at the fish market and I have a sneaky suspicion that’s where they all went. Thanks for another good read. Great stuff Shawn. 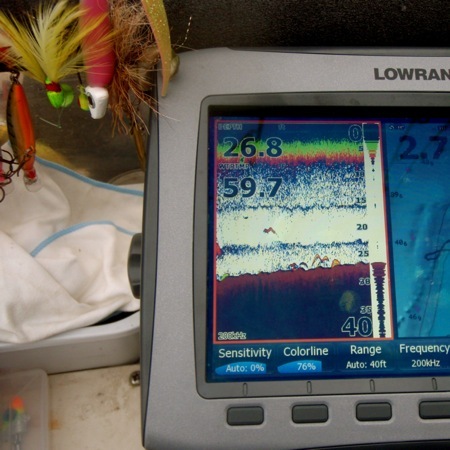 Its so interesting how you explain the current Bay conditions and the affects on the fish. Great picture of Jamie, lord knows I’ve seen that “pose” countless times over that past couple of years. Great information Shawn. 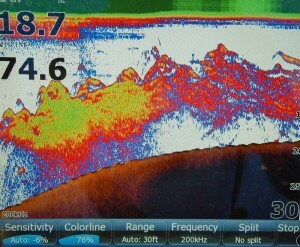 While out last night I saw the Haloclines on my fish finder and thought they were thermoclines. Now I know. Caught a sunfish of all things wile fishing for perch near the bridge,a first for me in the bay. Interesting stuff. Great article. Glad you caught some fish especially that fat 25″er. When I’ve been out, once we’ve found some fish it has been a challenge to get them to hit. I’ll keep tryin! Trolling has been good around the Tank but it’s all little fish. Glad to see you are turning up some better ones jigging. I really need to learn how to do that better. Can’t buy a fish in the main stem. I don’t feel so bad now. Man, dem yellow fish’n shirts sure are purtty at sundown. Shawn: Outstanding information as usual. One thing I have always enjoyed about fishing is I’m always learning something new. Please keep posting so all can learn. you truly get it that it is the little things…or at least they seem little to most people…that can make the biggest difference between a day of fishing and a day of catching!